The Mavic Pro is Better Than The GoPro Karma in Every Way. Look, I’m just going to say it: The Mavic Pro is in my personal view (and the majority of people who have tried both models) is far superior to the GoPro Karma. 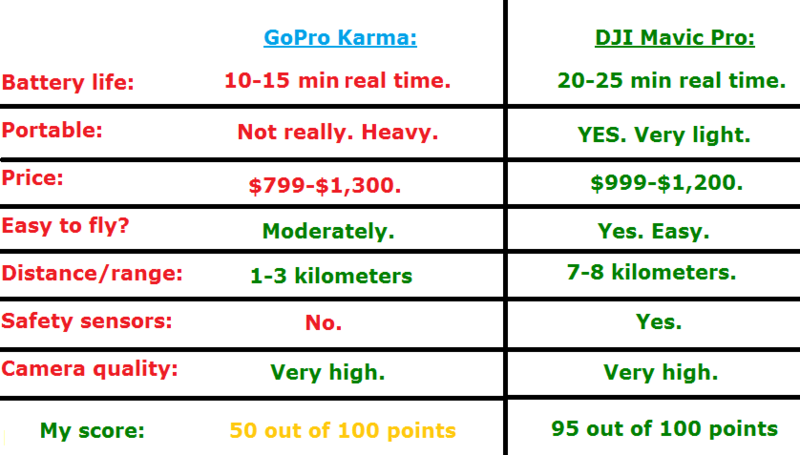 There are numerous reasons why which I will point to in this comparison and for the prices both these models share, which is around the same anyway, the DJI model is far better to buy. I’ve used and continue to use this model with tremendous success. It is extremely portable, it has a fantastic camera and the flight capabilities are in the most elite level there is when it comes to all the drone models available today. As I said in my review of this drone, it is at the top of the mountain with a few others. It is my go to “default” model to use whenever I fly somewhere new, because it’s size allows me to fly in just about any area, not just an open field and I can get amazing pictures and videos. I absolutely love this model. My story with this model actually predates the MP because I actually got it before, yet my 2 short weeks of “trying” to use it failed miserably due to certain bugs and annoying troubleshooting steps I could not get through no matter what I did (I took it back to the store, I looked at forums, I did many things to try and get this thing to work). The main issue was that there were a number of firmware updates that needed to be completed for a number of accessories and if it wasn’t ALL aligned together and in sync (which I couldn’t get it to do), it just wouldn’t fly, period. I later had to even replace my Hero 5 Black Camera (a second time) because it just wouldn’t update and that is only part of the problem I have had with GoPro products over the years, including the most recent with the Hero 6 camera I had gotten, which also turned out to have a defect, and then another with the replacement I had gotten. But on the upside, the drone itself is very durable and can withstand some really strong weather conditions. Yet this and the camera quality of this model are the only 2 things I’d say that make it worth the purchase. On the flip side though, while I like the camera, the drone itself is FAR too expensive for the quality you get. There are a lot of features missing here that the MP for example supplements and takes to the next level (I’ll point them out in a bit). The MP has a 12 MP camera, 4k shooting capabilities at up to 30 fps. You can see examples of how well it shoots here. The Karma doesn’t actually have a camera, you have to either buy the Hero 5 Black with it or separately. With this model, you have 2 choices, the Hero 5 Black and most recently, the Hero 6 Black. The Hero 5 Black also has a 12 MP camera and shoots in 4k, also with the capabilities of 30 fps. The Hero 6 Black however goes further with also a 12 MP camera, but now it can shoot 4k in 60 fps. My personal opinion is that the video/photo shooting quality of the MP is superior to the Hero 5 Black, even though the parameters are nearly identical, although the Hero 5 Black has more customization options, and that’s great if you’re a huge camera buff and know how to edit the picture/video for better footage. Yet I will still say from what I’ve personally seen and filmed, the Mavic’s is still better, just slightly though. But what about the video quality? Would the Mavic’s camera beat the Hero 5 and 6? However, based on what I have gathered in the image comparison, I will say that the Mavic Pro’s camera is still superior to both Hero cameras because from what I did see, there aren’t noticeable enough changes between the image quality and in some cases the 5 is better, and since the Mavic is superior to the 5, I will say it’s also superior to the 6. 2) Now for the actual drone: The MP wins by a lot. Is more portable. It’s simply easier to carry around, no debate here. It weights FAR less. It’s about twice as light. It has flight features that are VASTLY superior to the Karma. Longer overall flight time. MP will get you about 25 minutes and the Karma will get you about 10-15 minutes. It has the capability to film better and safer in tighter spaces. It is able to hover in one place FAR better than the Karma, which tends to drift a lot more often is left flying in one spot. Sensors. These things make it safer to fly and avoid people/obstacles, while the Karma has NONE of them, making it something that requires more careful piloting skills to fly safely. When I first got my Hero 5 Black (before I even got into droning), the VERY first problem I had was that the place where you open up and insert the battery/SD card was broken. I couldn’t open or comfortably close that space. I ended up replacing it for a new one, which actually was the one I used on the Karma. The problem was the firmware was impossible for me to update, so impossible that I sent it back to GoPro and they sent me a NEW Hero 5 Black. That makes 3 cameras that I went through over this long haul. Now just yesterday I got myself the Hero 6 Black and guess what…it ALSO has the same problem with the opening where you put the battery in. I am in the process of returning this one too and replacing it. Update: The second camera I got was the one which had the issues with showing the video I shot at 60 fps. I finally decided to give up on GoPro and just returned the camera altogether, these purchases are not worth it for me anymore and there is little/no change between the 5 and 6. I’ll save myself $500 and wait for something else. Look…I love the camera quality this product puts out, but either I’m extremely unlucky to keep buying a defect model over and over or there’s an issue with the company itself. Now if you also didn’t know, the Karma itself ALSO had a defect when it first came out, which had to do with it’s battery, a dangerous problem which was corrected but still the model itself is in my opinion too cheap in quality and too expensive to equal that quality. I would even price this drone at $300 TOPS. While the camera may be slightly better (if you can get the footage to actually show), in every other category, the Karma loses by a lot to the Mavic. Simply re-look at the points made in 2. It doesn’t matter what new update the Karma has or how much better the camera gets, this drone will be still be LEVELS below the Mavic. 4) So let’s look at the price…Mavic wins again. Karma without the camera: $799. With the camera (Hero 5 Black is the default one): $1,100. Right now there is no package available for the Hero 6 Black with the drone, so your option is to buy the drone itself without the camera, then get the Hero 6 Black separately which would be $799+$499. You’re looking at about $1,300-$1,400 with taxes. For the drone itself which includes the camera (it’s attached to it): $999. There’s also a “combo” where you get extra accessories: $1,200. In the CHEAPEST case scenario, you’re looking at $999 for the MP and $1,100 for the Karma (you can’t fly it without the camera so you need to get it as well). At it’s most expensive, again the Mavic is vastly cheaper and you get way more with it’s combo package being $1,200 and Karma (with a Hero 6) totaling to over $1,300. With this simple price in mind, plus taking into consideration just how many more capabilities the DJI model has, you’re making a FAR better investment in buying that vs buying the Karma. I personally fly with the Mavic, but “intend to” use the camera separately on trips (I’m talking about the Hero 5, I’ve given up on the 6). I’m MORE than fine with the quality image/video I get from my Mavic and when it comes to taking trips where I can’t use my drone, the Hero 5 will suffice in just about any circumstance. Which one’s camera is better? It’s debatable. Which drone is better? Oh goodness, the Mavic. Easily…you will actually get a HIGH quality flying machine with this. Which price is better. Mavic again. I’ve provided links to the specific reviews and specs of each model above but I do hope this comparison has helped you. I know I said I would be unbiased, but I am sharing all the personal experiences I’ve had with both models (and cameras). Which one has a better customer service? GoPro. Ok, they are good here, I’ll admit. I wouldn’t have been able to so easily replace my camera if it weren’t for the patient, helpful staff that assisted me. Which model is better/safer for beginners? Mavic. It’s safety features are incredible. Which one has better advertising? GoPro and I actually say this because I think it’s one of the biggest reasons why they can “get away” with getting such great sales, yet have such huge bugs and lemons in their product arsenal. The videos you see them using to advertise their stuff are truly amazing. Yet, this leads people like myself to believe that it’s easy to use and there’s no issues/tech problems to worry about. However, I am not the only one who has complained about the problems I’ve listed with GoPro products. I feel like it’s a dirty secret within the company and frankly, the issues they have, at least the ones I had, are EASILY correctable. Why are they so lazy and keep making these mistakes!? Who has the better reputation? DJI. The irony of this whole thing on advertising is that DJI probably doesn’t even have a 10th of the reach that GoPro has and yet their products are WIDELY popular with their customers because the people buying from them know they’re always going to get a secure, safe and HIGH quality product. I feel like DJI has developed the type of solid reputation that for example Apple once had when people knew they were buying the best phones/computers on the market and DJI is doing that with drones. They are easily the best. GoPro at one point was good, but I think their popularity and success led to the erosion of incentive, because honestly, they’ve been putting out some bad products in my opinion and the changes between for example the Hero 5 and 6 do NOT justify the price increases. I mean come one, the footage is better on the 5 than 6!? Seriously GoPro, what’s wrong with you!? But if you own either of these 2 drone models, PLEASE share your thoughts on them and if you agree with my drone comparison! When I first tried to return and exchange it, the sales rep who assisted me agreed with my position on the fact that DJI drones are superior to Karma and even said they try to get people to buy the DJI models if they come in and are interested in the GoPro model. Couldn’t get the Karma to work. Went through 3 different Hero 5 Black cameras, and the third one works fine. Went through 2 Hero 6 Black Cameras, and returned both of them for the issues I mentioned above. Now I’m not going to say that DJI is perfect, they have issues as well, sometimes drones can “act up”, but the problems are fixable and you have so much room to edit/fix the model’s software and in short, I’ve had much LESS of a headache dealing with DJI and a lot more fun with them vs GoPro which has so far been an equal number of good and bad experiences, which is unacceptable. So overall, get the Mavic Pro (or Mavic Pro 2 if you want the next level). In my opinion if the GoPro staff recommended you buy the Mavic drone over the Karma then they even see the Mavic as a superior product. After reading your review I will stay clear of the Karma and look at buying a Mavic. I need a drone to watch livestock on my farm, and I am not technical enough to fix software problems. Thank you for writing this review, it will save a lot of us headaches. It wasn’t GoPro staff Mike, it was the people who worked at the store which carried the GoPro products. Still they were technical enough to know the difference and agree with me. I think the Mavic will serve you fine for what you said you will need it for. Very informative article, definitely was not aware of the downsides to the GoPro Karma, as they try to hide that or spin them as positives on their own site. The Mavic seems like a much better choice for the buyer, the comparison of captured footage is night and day, the Mavic is high resolution and crisp with colors that pop, the GoPro Karma just looks kind of faded and washed out by comparision, not terrible on its own but the contrast between it and the Mavic really show how behind it truly is. Honestly, if the Mavic had a detachable camera like the Karma does, there would be nothing that GoPro would be able to beat it in. But we are comparing the drones, and you already know which is better, but you can’t do a comparison between these models without looking at the cameras and I honestly believe, the Mavic’s is better. Your article was quite helpful. The side by side photos really give a solid comparison between the two. I am on your side when you say that the DJI Mavic Pro is the better one. You get more for the same price. I do have a question though. Are there any attachments or extras I can get for the DJI Mavic Pro? It looks amazing, but it would be nice if there were more I could add to it. Thank you in advance and I hope you have a great day! There’s lots of accessories available on this drone Alex, the industry is just so huge that plenty of people come up with ways to add to the model. I am writing an article on the various one available for this drone and which ones you should get. I will make an article on this very shortly. I have been looking into buying a drone myself because I want to produce some videos of all my vacation adventures. I was thinking about the GoPro drone until I read your review. It sounds like the Mavic might be better on quality as well as my budget. I am also looking for something that has excellent ease of use and is not too complicated to learn. This was a comprehensive review, and I am going to check out the Mavic now since you have highly recommended it. You’ll get a better picture, it’ll be easier to set up and overall, the fact that you mentioned wanting to take it with you on vacation means you’ll also benefit from the Mavic’s awesome portability, you are making a great choice here Josephine. Great Review! I’ve always thought of buying a GoPro as it was a trending thing and the video quality really appeals to me. Drones were another cool gadget I was looking into. I can see why you are leaning towards the Mavic Pro from this review. Not many Vlog people use GoPro in my experience because the image stabilization is better on other models like sony’s action camera as is the image, something worth looking at, although there’s no drone made by Sony (yet). That was an good article and it let me find what I was looking for! I always thought the gopro Karma was better because my friend had one and he always bragged about it, but this has changed my mind. I was wondering though what drone would be best at a $100 price. I’m slowly getting into reviewing cheaper models than these Evan, so I may be able to give you an answer eventually. What you can do in the meantime is head to websites like Best Buy or Amazon, type in drones and see which ones fit your budget and get the best reviews for that budget. This will help you out.